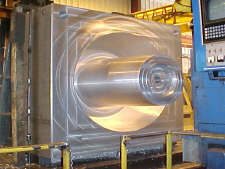 Circle Boring has the capability and experience to successfully complete all of your large part milling and boring projects. 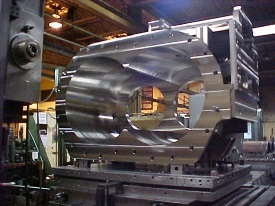 The mold base shown in process to the right was machined from a solid forging. The forging was 6 feet square by 5 feet thick. The tapered bore around the center stem was circular interpolated on one of our large CNC mills. This part being bored was entirely fabricated out of Hastelloy™. 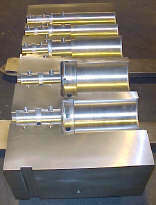 Many extreme machining challenges were met to successfully complete this project. The bores pictured were 32" diameter and the bore on the right side had another intersecting bore from the top. 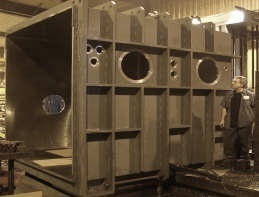 There were many other elements of this project that required outstanding milling and boring skills and equipment to complete the project to the needed specifications. We are known for the finish bores we achieve on critical parts. We have been able to help some customers eliminate a honing or grinding operation with the bore finishes we regularly accomplish.